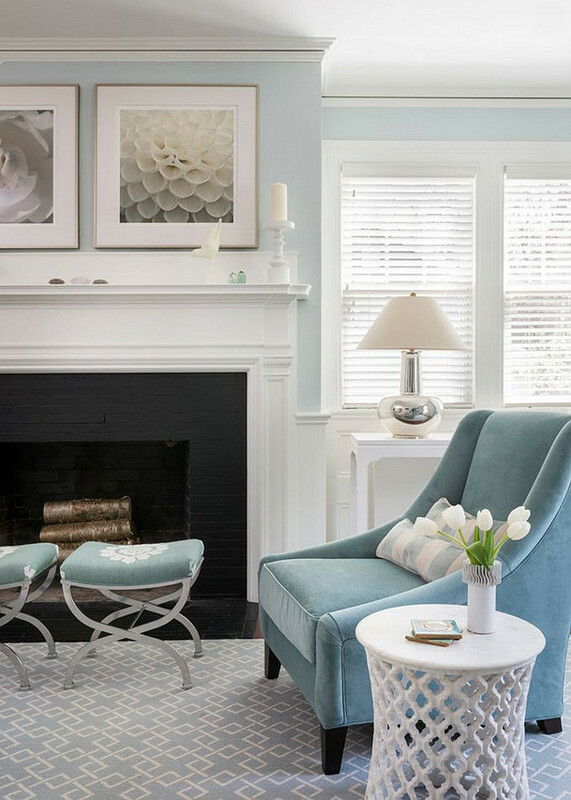 Spring has already sprung and I can’t tell you how many emails I receive regarding my online interior design services. Sometimes I really wish I was more than one person so I could help more clients since my work is on a first come, first served basis, and this is a very busy time of the year. Why? I feel that every spring, as the weather changes, we want to start opening the windows, let the sunshine in and finally start working around the house so everything is ready when summer (and guests) arrive. When it comes to home renovations, kitchens are, without doubt, the most wanted room to be renovated and I complete understand why. Kitchens, as predicable as it sounds, are the heart of a house and, like it or not, is where we spend most of our time, not only cooking but also living. It’s in the kitchen that we often have great talks with our family members It’s where the kids usually do their homework, and it’s there where many of us make the most memorable memories of our life with our loved ones. Who can’t associate their own childhood spending time in the kitchen with their family, preparing meals or waiting for the meals to be ready? 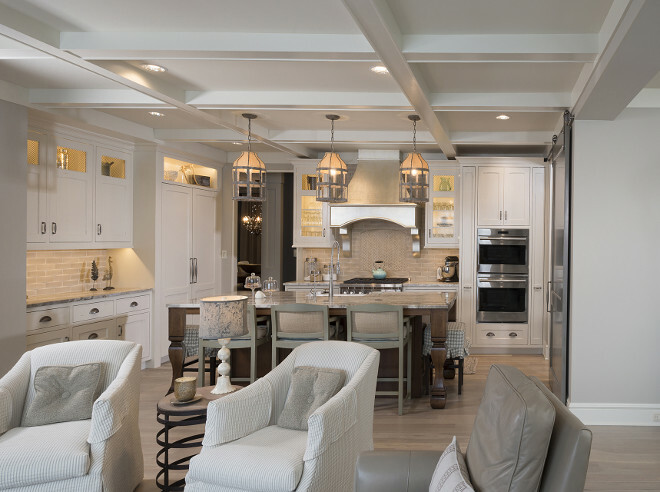 I can’t blame anyone for wanting to have a kitchen that is not only beautiful but also that works better so they can register their moments in a space they love as much they love spending their time in it. 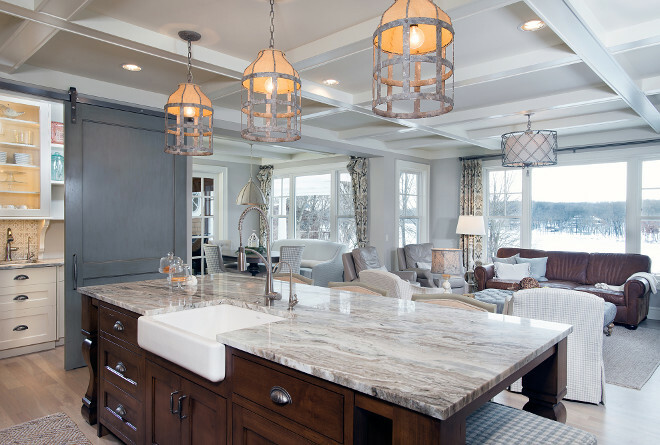 Take this open neutral kitchen for example. 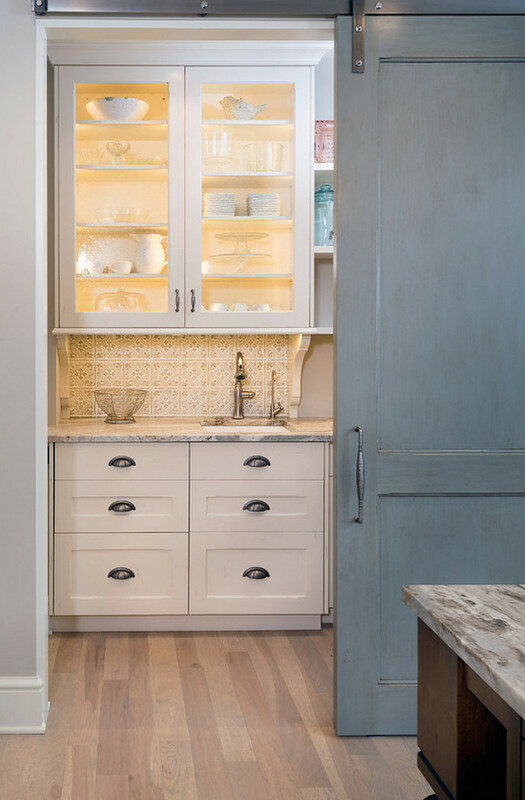 This kitchen features a sense of rustic interiors that blend perfectly with the soft color palette and warm decor. I hope this comes to inspire you to eventually design your own dream kitchen, because, yes, you deserve it too! 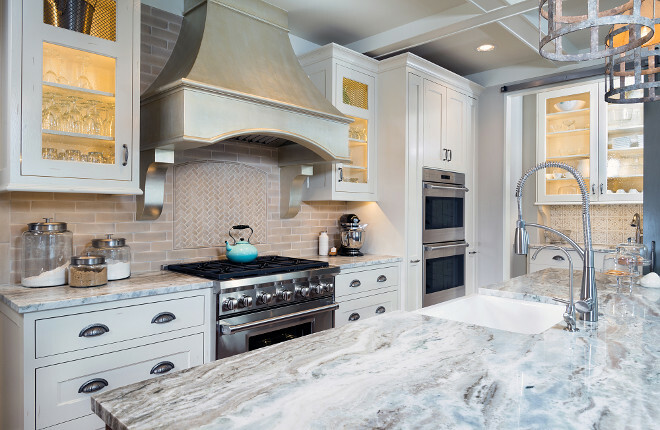 I love the textures and colors found in this kitchen. This space is warm and easy to live with. 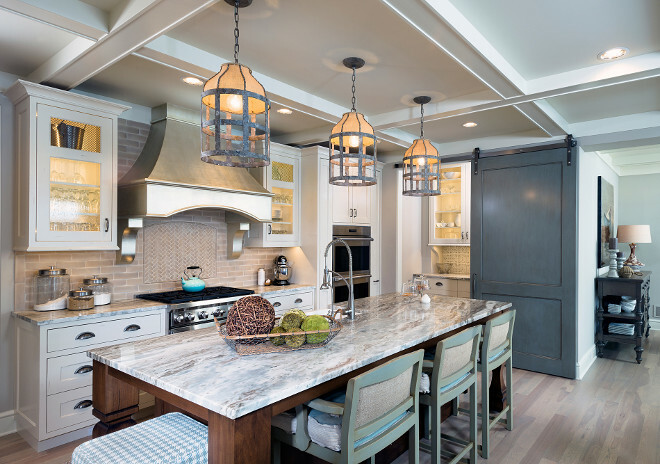 The three pendants above the island is Lucia Chandelier SCH-550225 Gabby Ceiling Mount Iron/Burlap. $622.50 each. 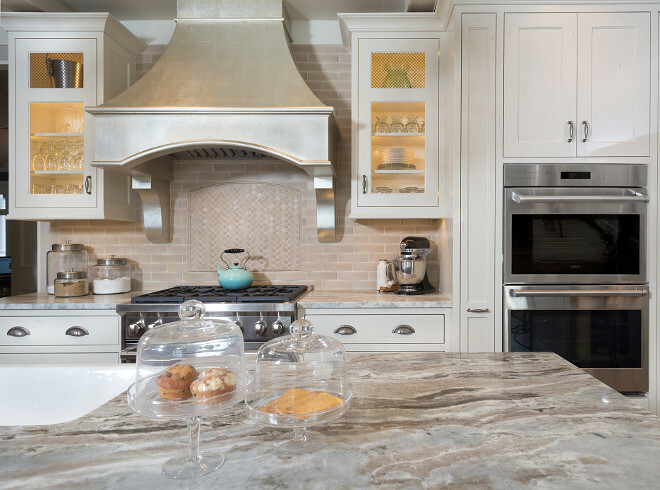 The countertop is a quartzite – Fantasy Brown. Cabinet paint color is Graham Paint 8180W Almond White. 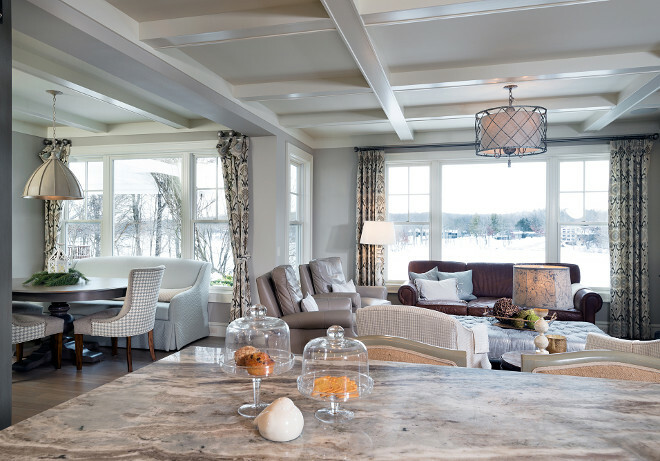 The coffered ceiling is painted in Revere Pewter by Benjamin Moore. 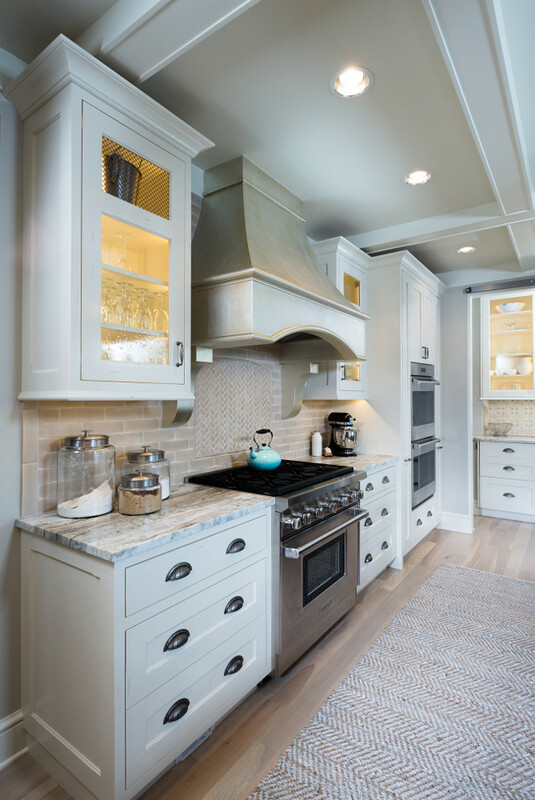 This kitchen hood was a custom piece by Benchmark Wood Studio and then faux painted out of silver leaf by the talented Diane LaLonde Hasso from Faux-Real, LLC. 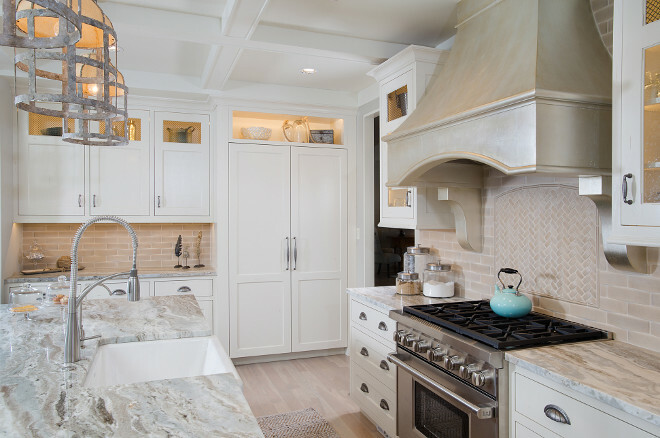 The kitchen backsplash tiles are all from the Vitners Reserve line from Tile Sonoma Tilemakers. Range Hood Accent – Tile Sonoma Tilemakers Vitners Reserve Arch Herringbone Clove 1 x 2 Brick Arch Brick Herringbone and Sonoma Tilemakers Vitners Reserve Panache Clove 3/4? x 8?. 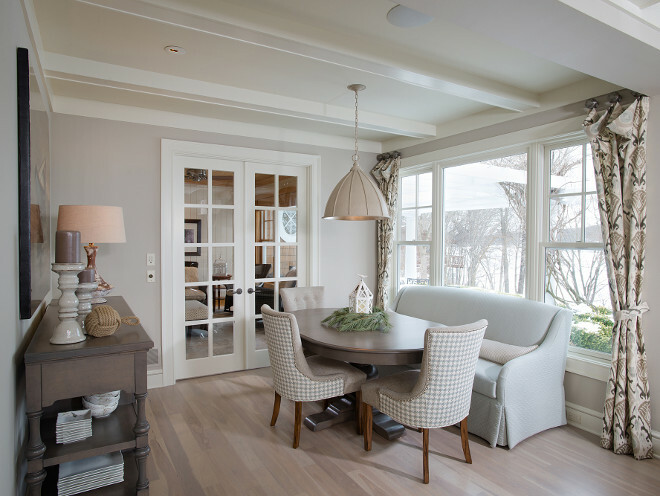 The gray barn door was custom designed by Benchmark Wood & Design Studio. The paint was also a custom color. 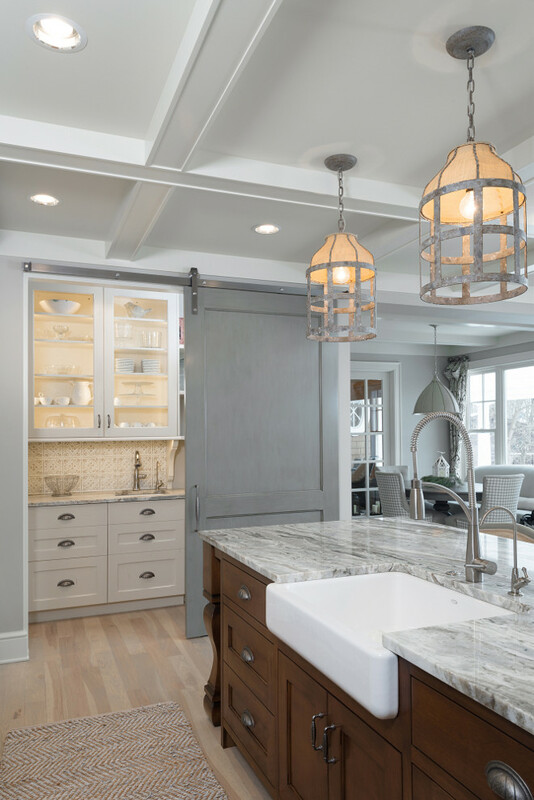 The kitchen bar can be concealed with a gray barn door. Island Dimensions: 54? x 34? x 37 1/4? tall. 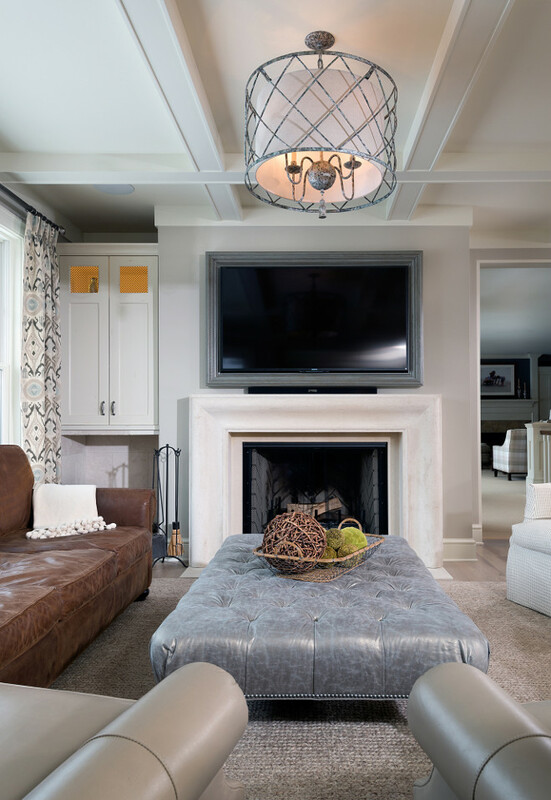 The kitchen opens to a breakfast room with settee and to a family room with coffered ceilings. 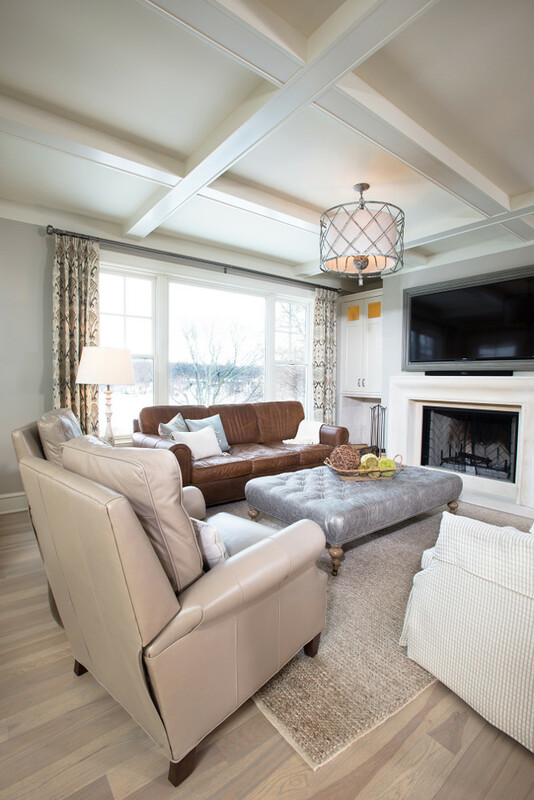 The family room, painted in Revere Pewter by Benjamin Moore, features limestone fireplace, whitewashed hardwood floors and a lattice drum pendant light. Floors are 4” Character Grade Hickory floors from Rivershores Flooring and are shown in a driftwood shade. According to “Oak & Broad”, hickory is a very hard and durable species and it makes great flooring for a busy home. 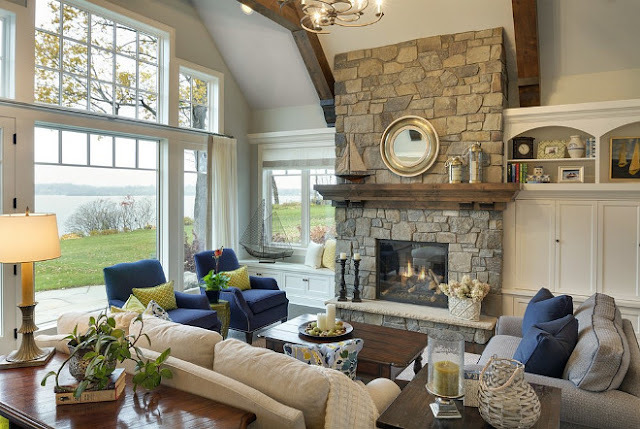 I love how warm and cozy this family room feels. 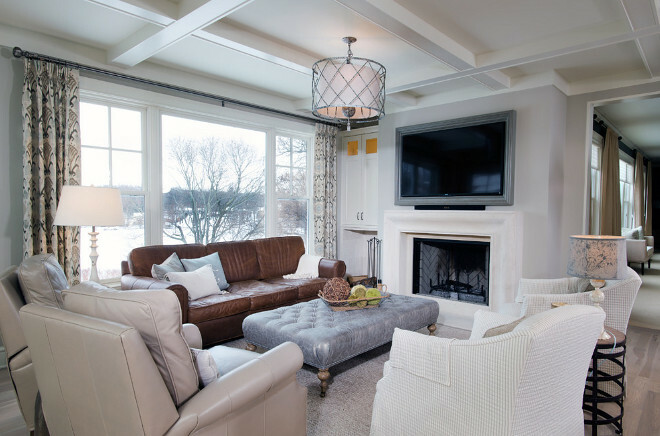 I also love the distressed leather couch with the other neutral pieces. Isn’t this breakfast nook darling? 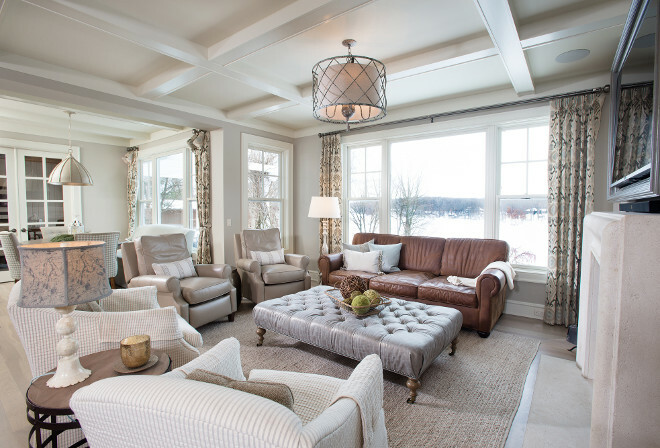 The settee and upholstered chairs bring some comfort to this space. 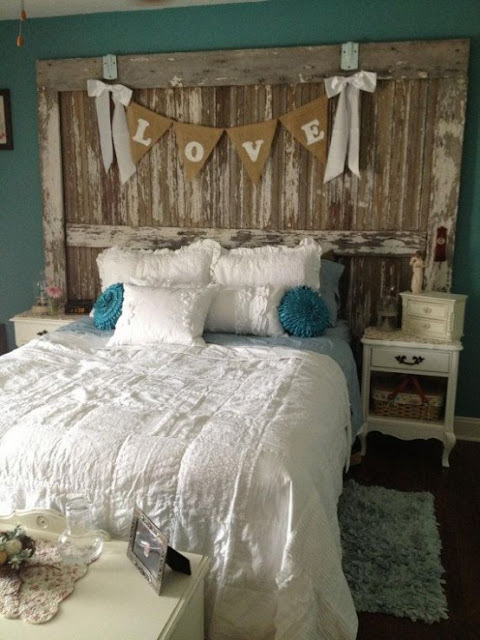 Paint color is Revere Pewter HC-172 Benjamin Moore.